A good Chinese endemic, Snowy-cheeked Laughingthrush was originally collected in the 1880s by M.Beresovsky in the Min Mountains of northern Sichuan. It is named after V.P. Sukatchev, his financial supporter. 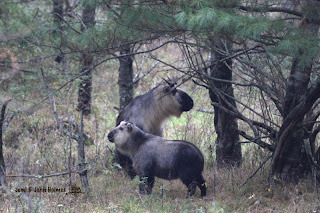 You can still see them at Wanglang National Nature Reserve, where I took this pic. last week. We're off to India tomorrow, and my normal, patchy disservice may resume in mid-December ! Wanglang, Ping Wu County, Nov 17th 2007. 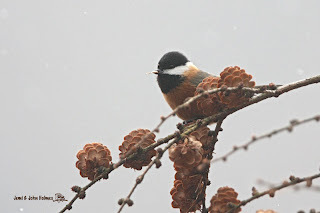 Wanglang has a common border with Jiuzhaigou, and should have most of the same birds without the distraction of a zillion Chinese domestic tourists.... but it seems to be largely ignored by overseas birdwatchers. Pere Armand David was one of the "Greats" of Chinese natural history pioneering. He spent many years in China, including a few months in 1869 near Baoxing, (in Sichuan) where the type specimen of Giant Panda was brought to him by his local hunters. David had earlier seen a panda skin in someone's house, knew it would be new to science, and sent out people to look for another one. You might assume that "Parus davidi" was one of the many bird specimens collected Pere David. But no, it was that Russian, Berezovsky, again. Berezovsky collected specimens of P.davidi in southern Gansu in 1887 and named them after David (long departed to France) in tribute. There is no evidence that Pere David ever actually saw one. Berezovsky also collected a rare and unusual parrotbill and named it after the greatest of the Russian explorers, Nikolai Przewalsky. But that's another story. Here's looking at you, kid ! 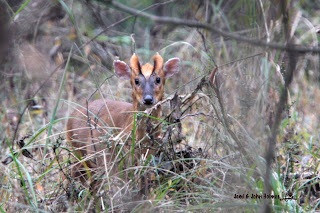 It's a Chinese Muntjac, of course. 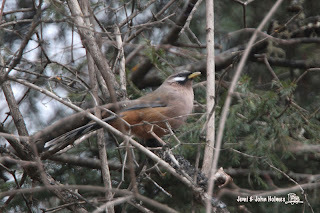 I walked around the nature trail at Tangjiahe in Sichuan on 12th November, and saw several of them. It really is nice to see large mammals in China. Tangjiahe in winter folks, it's a good place to visit ! Some of the most colourful birds on the Tibetan Plateau are named after the Russian explorers who travelled and collected there in the late 19th century. Petr Koslov left it comparatively late, arriving in Yushu (Jyekundo to Tibetans) in the summer of 1900. 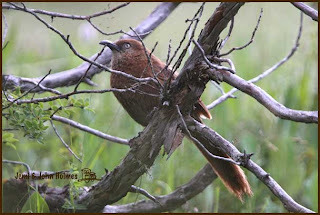 He continued south to where the plateau breaks up into deep, pine-clad valleys, and there shot a few specimens of the rufous babbler now known in latin as "Babax Koslowi" - Koslov's Babax. Of course now the trend is away from using the names of western pioneers in English bird names. 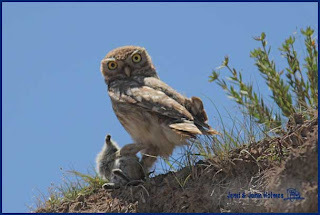 In "A Field guide to the Birds of China" (2000) it is referred to as "Tibetan Babax". But "Tibetan" is the first half of the name of some great birds, too.